are long weapon versus either short weapon or double short weapons. For example, with pu dao versus saber what we really have is a contest between two saber blades with speed and perhaps a little more precision on the part of the saber and reach and probably slightly more hitting power on the part of the pu dao. There would be the question of whether the juncture where the pu dao blade joins the staff holds up as well. Can the staff of the pu dao successfully block a saber cut? 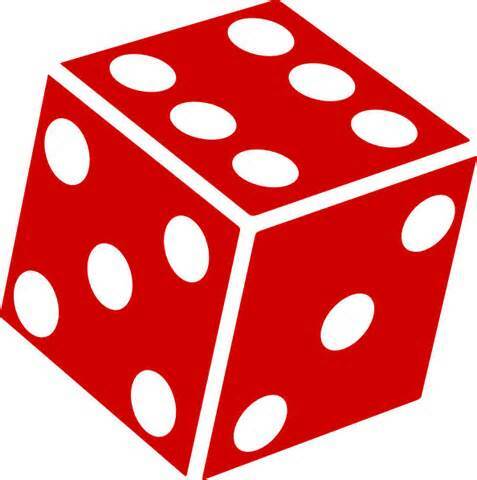 There’s the additional consideration that the lower end of the pu dao can also deliver a strike as well as a block. I have never seen a weapon that we might describe as a double-headed pu dao – a saber blade on each end. 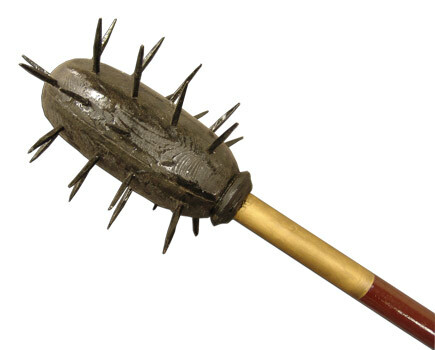 It is also possible to enhance the staff section of the pu dao with crescent moon guards or spikes that could not only serve to deflect slashes (presumably aimed at a hand or maybe just the staff/handle itself) but could also be dangerous – we hope for the opponent only – during close encounters. As before, adding the weight for guards and spikes is trading some speed and flexibility for tactical advantages. Hybrid weapons like the horse-blocking knife and the sun-moon swords add the crescent moons, but I have never heard of a pu dao, which would have a longer, heavier blade, with such additions. When the opponent has double short weapons the tactical situation for the pu dao wielder is not so simple: just bashing aside the enemy blade and lunging in is very likely to encounter enemy blade number 2. This means preference should be given to beating aside the enemy’s right hand blade (for example) NOT outside to the enemy’s right and your left, but rather the other direction. There’s not much effort put into long weapons blade or head design in terms of seeking to entangle (and presumably wrench away or snap) an enemy blade. 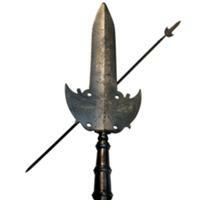 It is possible to have a long or short staff on the wolf tooth mace (Lang Ya Bang – also described as a club sometimes). I have only seen it associated with Xing Yi Chuan and Ba Ji Chuan. A formidable weapon in any case. And symmetric. Perhaps finding my inspiration in a Bagua Zhang double-ended spear, I always wanted to have the two ends both have the wolf teeth – a fearful symmetry indeed. As far as European polearms go, they reached a peak in popularity before the introduction of guns. Up until the 15th century or so infantry that stayed in a coherent formation and had lengthy weapons stood a good chance, often a very good one, against even heavy cavalry. If the momentum of the charge could be reduced by multiple spears pointed at the horses the foot soldiers could counterattack. The polearms could be used to slash at the horse’s or rider’s legs. Once a knight was dismounted polearms and axes could hammer him to the ground. There were really no standards for polearms so shafted weapons with functionally similar heads went by different names in different countries over time. The ox’s tongue (left – courtesy the St. Louis Art Museum) – known in French as langue de bouef – has been described as a simple blade (well, 12″ long and 4″ wide) on a 6′ to 8′ shaft. A wooden or metal crosspiece might be attached using the two holes. This was a device favored in northern Italy, Switzerland and France. The partisan (right) was from the same regions but had an integrated crosspiece. It has not been established what the partisan was designed to do or how the four holes would help. Weapons without blades like the staff and half-staff (jo) can be thought of as radially symmetric because there is no need to hold them in any orientation in order to strike an opponent. For maces with a square cross section this is the case also – whether defending against an incoming blow or delivering a strike it does not much matter whether a flat surface or an angled surface is leading. Tactically, turning a trident parallel to an opponent’s axis of attack so the tines are in a column perpendicular to the floor seems ill-advised as it reduces horizontal protection. 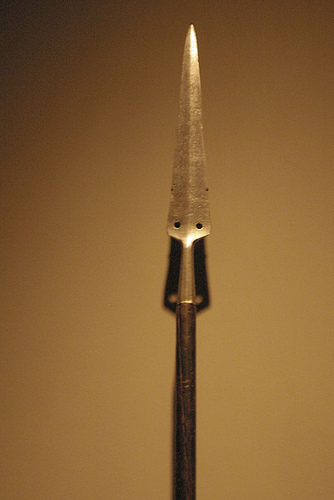 There’s a fair amount of debate about whether all three tines should have the same effective length: the argument goes that shorter side tines provide no advantage and that most of the time an enemy need only focus on following the longer central tine – track it and block it and the side tines are not much of a threat. I have never heard of a five-tined “fork” weapon with four tines arranged around a center tine like the five side of a six-sided die. “The Department of Developmental Services is pleased to announce that on December 31, 2014, a Home and Community-Based Services Waiver application seeking federal funding for the Self-Determination Program was submitted to the federal Centers for Medicare and Medicaid Services (CMS). A copy of the Waiver application will be posted on the Department’s Web site soon. We are very appreciative of the significant efforts of the stakeholder advisory group that has been instrumental in assisting the Department in completing the Waiver application, and we look forward to getting continued input from a wide range of sources as we progress toward implementing the program. As required by law, securing federal funding is necessary in order to implement the Self-Determination Program. CMS has 90 days to take one of three actions on the Waiver application (approve; deny; or request additional information). It is very likely CMS will request additional information to clarify information in the Waiver application which will lead to an extended review period beyond the initial 90 days. While CMS is reviewing the Waiver application, there is still much work to do including the development of training and informational materials regarding Self-Determination. We’ll continue to post progress updates on the Self-Determination Program website as we move toward implementation.